The Christchurch Ilam Botanical Gardens in flower are a feast of brightly coloured deciduous Azaleas and rhododendrons. Paths and lawns are surrounded by rows and layers of wonderfully coloured flowering shrubs. I first visited these botanic gardens in mid-spring. The large red rhododendrons were out, but it was too early for the azaleas. I must admit the gardens looked a little bland, and I was a little dismissive when I wrote of my first visit. I couldn't really imagine what all the fuss was about. Well, this second later visit has proved me wrong. 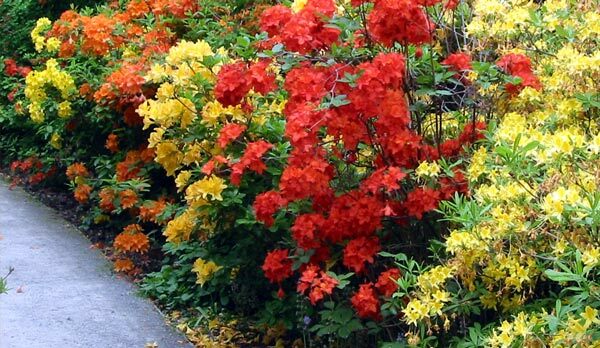 The Ilam Gardens Deciduous Azalea Colour Festival is not to be missed. It's actually very gaudy, very bright, and very unreal - but nature gets away with it. 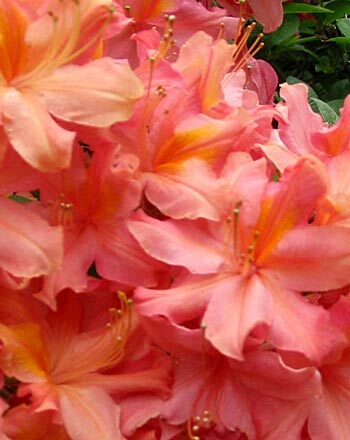 The Ilam hybrid azaleas are famous in New Zealand, at least. Their flame colours - oranges, reds, yellows, and all shades in between - are a shocking but beautiful sight. There are many garden beds mass planted only with these shrubs - naturally they come alive when the Azaleas are in flower, and when they're not things llok rather dull. The stream which wriggles through the garden has its banks planted with huge clumps of Gunnera, and there are many Cordylines and large ferns. These greens brings a sense of calm to the rioting azalea colours, as do the well manicured (and strangely duck-less) lawns. I'm always envious of the huge trees that public gardens like the Ilam Botanical Gardens have - they make the Moosey trees seem so juvenile in comparison! I've never fully appreciated how large Azaleas could be. I'm used to seeing the silly small plants which are sold in nurseries and supermarkets. And I've been brainwashed into considering real rhododendrons as the more worthy flowering shrubs. Bright colours like orange are difficult to ignore, too. Azaleas in the Moosey Garden? Would I like these fiery colours in my garden? 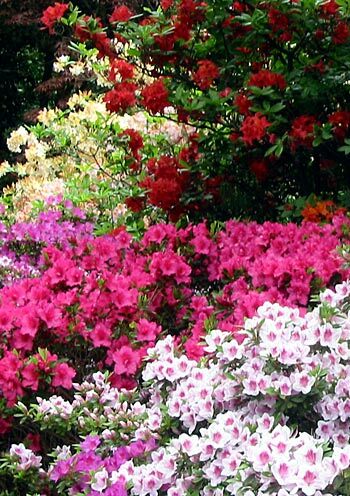 I'd love them, but I'd be too greedy to devote whole garden beds to deciduous azaleas. I've got just a few, and they'll do for now! My second visit to the Ilam Botanical Gardens was a great success - it gets a definite not-to-be-missed rating.